Watches with lume – not just practical but well, just plain fun. Whether the watch has luminous hands, markers or dial, whether it is tritium, SuperLumiNova or even radium, there’s something about a watch lighting up at in darkness that just mesmerises us. When researching watches with good lume, a number of models and brands seem to come up repeatedly as having particularly good luminosity. One of these is German brand Steinhart’s Triton 100, which comes in a couple of versions. Today, we look at the stainless steel one. The Triton 100 is a bead blasted stainless steel diver powered by the ever reliable ETA 2824-2. At a size of 45mm and 14mm thick, it may be a slightly larger size than many are comfortable with, but what you notice most about it is its heft – it’s a decently weighted 199 grams on the rubber. If you are used to lightweight watches, I’d suggest that you test drive this or a similarly weighted watch before buying this one, or perhaps put it on a NATO strap. The black dial has a good clear design, with white numbers, orange markers, and the white border of the (quick set) date window harmonising and balancing well with the ’12’ marker. It feels functional and uncluttered. The hour and minute hands are large and distinctive, their inverted colour designs quirky. A helium release/ escape valve is a feature found on some diving watches. Commercial divers often spend prolonged hours in diving bells under pressure breathing a breathing gas that contain the gases helium or hydrogen. These gas atoms are able to work their way inside the watch, around any o-rings or other seals the watch may have. When the decompression stops during resurfacing aren’t long enough, a pressure difference builds up between the trapped gas(es) inside the watch case and its environment. The helium molecules diffuse and penetrate the material of the gaskets and may result in the watch’s crystal popping off. The Triton 100 has a flat sapphire crystal is coated with two layers of anti-reflection coating and the dual coloured luminosity of the numbers, index, minute and hour hands comes up every bit as well as they say. This is definitely a watch for people who love good lume. As I am not a diver, I cannot speak about its functionality as a diving watch but I’d say that visibility wise, it should fare well. Case: Bead blasted stainless steel. With a power reserve of approximately 40 hours, this is a sturdy good looking tool watch with a good secure deployant. Of particular note is that the different colours of the lume on the minute and hour hands make the time easy and quick to read in darkness, and I liked the matte-ness of the blasted SS. I was really taken with this watch in photographs and in the metal it proved to be equally likeable, the only unexpected factor being the weight. All in all, it’s a well-priced piece. 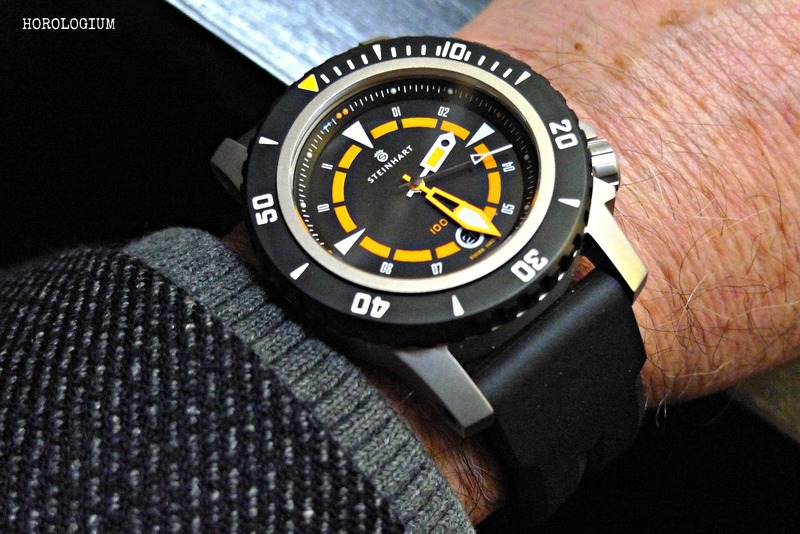 If you are on the lookout for a diver at about this price point and want to look at a brand that is not on most people’s radars but which is still known for producing solid watches, the Triton 100 is worth considering. 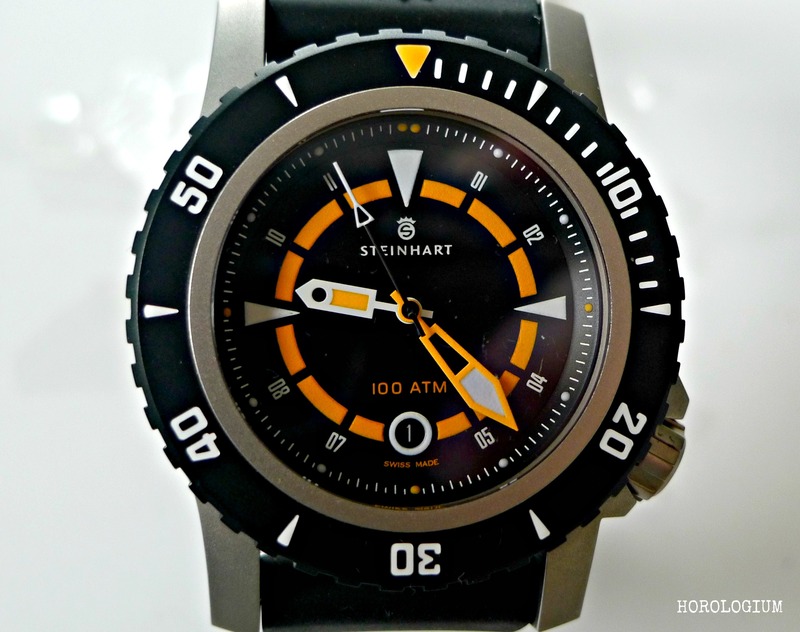 Steinhart watches come with a 2 year international warranty and you can buy them direct from their website. The Triton 100 Stainless Steel is currently priced at 570 EUR (incl 19% VAT) and 479 EUR (excl. VAT). The DLC version is currently 580 EUR (incl. VAT) and 488 EUR (without VAT). ‹ What sort of a watch does a Dingo wear?